Hendershot accepts the “Excellence in Teaching about Agriculture Award” and $500 check from Stewardson. 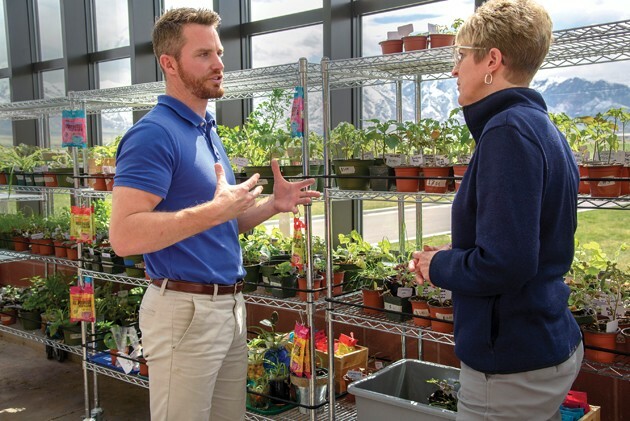 Brad Hendershot gives Denise Stewardson of the Utah State University Agriculture Department a greenhouse tour at Excelsior Academy Friday afternoon. 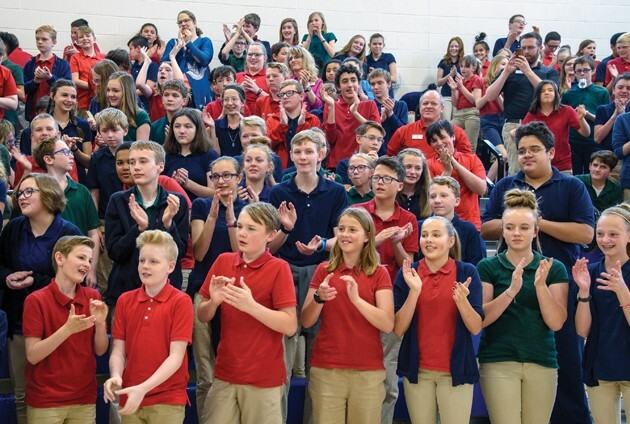 Students and staff give Hendershot a standing ovation as he receives the “Excellence in Teaching about Agriculture Award” at the Excelsior Academy Friday afternoon. Brad Hendershot talks with students about their vegetable garden project in the greenhouse at Excelsior Academy Friday afternoon. If you wore clothes or ate food today, thank agriculture. 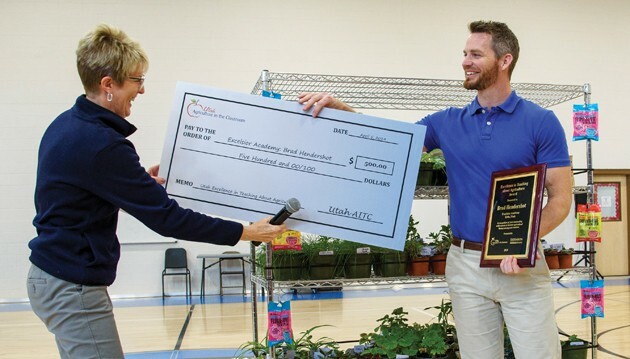 That’s how Brad Hendershot, a science teacher at Excelsior Academy in Erda, started a school assembly presentation on the Greenthumbs class that he teaches. Hendershot was awarded Utah State University’s Excellence in Agriculture Education Award during the assembly on Friday at noon. In addition to the state award, Hendershot was selected by the National Agriculture Education in the Classroom Organization, an affiliate of the U.S. Department of Agriculture and Farm Credit, as one of eight teachers nationwide to receive its National Excellence in Agriculture Education Award. Farm Credit is a nationwide network of customer-owned financial institutions that serves farmers and agribusinesses. Stewardson presented Hendershot with the state Excellence in Agriculture Education Award, which comes through USU’s Extension program. Along with teaching science, Hendershot also teaches two “Greenthumbs” classes at Excelsior Academy. Students receive a science credit for taking a Greenthumbs class. In the Greenthumbs class, students are divided into four crews: greenhouse, garden, nursery, and sales and marketing. 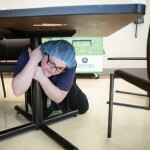 Each student has a responsibility, from shoveling compost to organizing sales events, according to Hendershot. Through their work as crews, students are able to see the progression from seed to sale. 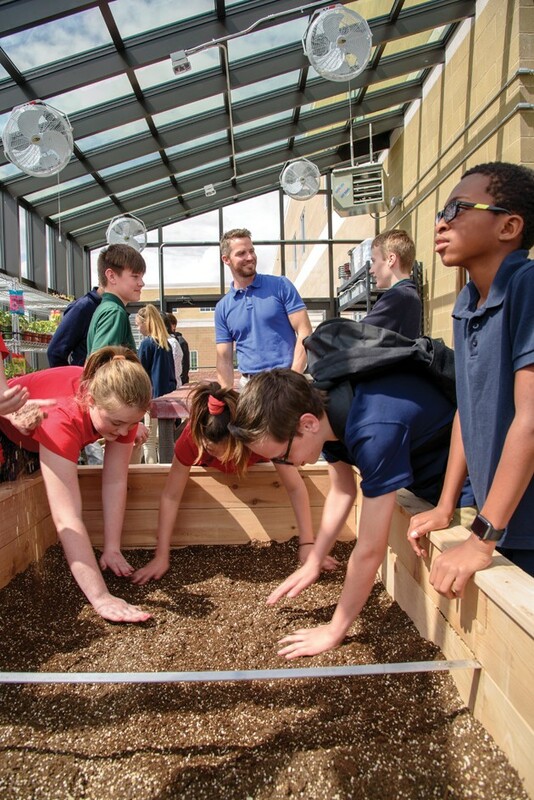 Hendershot’s classroom, in Excelsior Academy’s new junior high school building, has a professional quality greenhouse attached to it that wraps around the outside corner of the building. A door in the back of his classroom opens up into the greenhouse, making the greenhouse an extension of his classroom. The greenhouse is equipped with boxes of raised beds for growing vegetables and flowers. A watering system that segments each box into one-foot squares sits on the top of the potting soil in each bed. Students are assigned to take care of specific squares, which is part of teaching square foot gardening — a technique that allows a large amount of healthy food to be grown in a small amount of space, according to Hendershot. 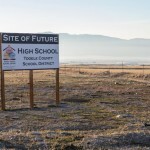 Students have been involved in every step of the greenhouse process, he said. During a tour of the greenhouse after Friday’s assembly, one student carefully explained how she helped measure and cut the boards and learned how to build the special joints for the corners of the raised bed boxes. Outside at a composting bin system, also built by students, another student explained the thermophilic composting process and how they turn scraps from the school’s kitchen, Soelberg’s grocery store, and neighbors’ yard waste into the potting soil used in the greenhouse. Hendershot said he is amazed at how his students have taken an interest in growing things. Hendershot carefully makes sure that his students aren’t just learning about growing plants. He harnesses his students’ interest in gardening to teach them science, math and technology, along with a healthy lifestyle. “They are learning leadership as they take on their responsibilities,” he said. As a recipient of the National Excellence in Education Award, Hendershot will receive an expense paid trip in June to the National Agriculture in the Classroom Conference in Littlerock, Arkansas. At the conference he will share his experience using agriculture to teach science, math, and technology with teachers from around the country.